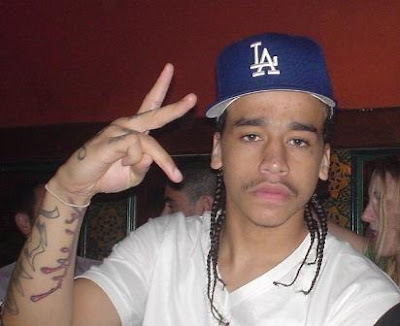 Undercover Black Man: Young rapper murdered in West L.A.
Twenty times a day huh? Sad part about it is that statistic ain't gonna die down any time soon man...it hits close to home, a cousin of mine was murdered last month, as well as my best friend a month before that, and another close friend in January. Left and right man. May God bless him and his family in this difficult time. I wasn't familiar with his work but know that he was an up and comer in rap. This just connected to me. I drove past the Beverly Center yesterday (as I do most days) and saw all the cop cars and one of the entrances blocked off with police tape. A very unusual sight for that location. Rappers die, man. I mean, blues men would die, but not at this rate. Is it the most dangerous artistic profession? Too many talented guys making (or about to make) a little bit of money who hang out with "the wrong crowd", as momma would say. UBM, I was wishing for you to come out of retirement, but wishing it wasn't for a tragic murder. Now I know I'm getting old when I don't even recognize the name of the rapper who got murdered. Senseless, tragic, but UBM is right...black on black crime is unfortunately, nothing new. Now I know I'm getting old when I don't even recognize the name of the rapper who got murdered. That's funny, DRE. Sad but funny. Woe: Sorry it's been hitting so close to home. Is it the most dangerous artistic profession? Pro wrestlers probably have a shorter life expectancy. But they don't be getting shot. artlung: Thanks for the good wishes. Habits are hard to break. UBM: Glad *some* habits are hard to break. My prayers go out to the family. This story is sad, but common. I don't think there has ever been a time in our history where young black people were in this much constant danger - from each other. LOOK AT THE DAMMM VIDEO! What other outcomes do you expect our babies to have. 2009 and we are in the worst condition, as a people, we have ever been. THESE are the topics that need to be discussed, not the outcomes because it's to late then! You got this trash (MUSIC) that our kids listen to, crime in our neighboor hoods and no one wants to say anything because they don't want to be "sellouts", the elders do not teach the history of our people instead they continue to dance with these devils and chastise the young generation when they step up to the plate. No respect among our women, look at these dammn magazine covers/videos. Spirituality is out the dammn door, without this we are like a man with no legs! I tell you what Black people we better break these mental chains or we will in a very bad place in the future. This goes for EVERYONE. The ones who know better teach the ones who do not know! And it's now turned into Six Feet Undercover Black Man. I've never heard of him. And I clicked on the video. Music laced with curses so I lasted about 5 seconds. Capone, Diamond, Dillenger et. al. got killed or went to prison. If your game is that out in the open, expect some problems. LA gangs will kill you. Learn from, Biggie, and now Dolla, LA gangsters are real. This is not a hip-hop song. They kill for fame. Use extreme caution in all parts of the city, including Beverly Hills and if traveling to Vegas, do not assume you are safe. Gangs will travel (see: Pac). Traveling to the Hood should be avoided at all cost. Peace be upon you Dolla. Fuk Dolla....Dey Put A Hit on his head..4 fukin wit Florida Niggahz..